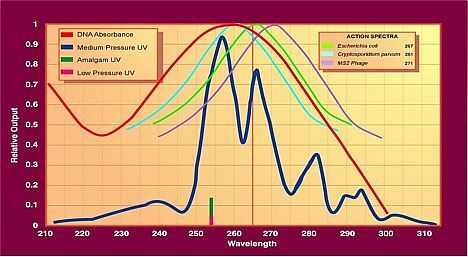 UV lamps contain a small amount of mercury, either in a free state within the lamp tube, or imbedded within the lamp tube's surface. When electricity is applied to the lamp, this mercury is "excited" and emits UV light. The exact wavelengths emitted depend on the vacuum pressure within the lamp tube itself. So called "Low Pressure" (LP) UV lamps are evacuated to relatively "low" pressures (between 1-10 Pa) and emit germicidal (I.E. UVC) light at a single UVC wavelength of approximately 254nm. So called "Medium Pressure" (MP) lamps are evacuated to what is termed "medium" pressure and emit a broader spectrum of UV light with higher intensities between around 254 - 265nm. Figure 2 represents this diagrammatically. Low pressure and so called "Amalgam" lamps are about twice as efficient at converting electrical energy into UVC light as compared to medium pressure lamps. However, medium pressure lamps emit far more UVC energy per lamps than does a low pressure or amalgam lamp. There are a variety of considerations to be taken into account when choosing which of these lamps should be used for a given application. The nature of this decision is quite detailed and can be left to a future discussion. Suffice to say that both low pressure (including amalgam) and medium pressure lamps are germicidally effective.